Ok, we’ll be careful, promised. In the early 1900’s the Winnipeg Electric Street Railway Company was using electricity for lighting the streets of Winnipeg and powering its streetcars for public transportation. This electricity was created in local steam plants and was barely enough to power everything the WESRCo needed. They were looking for a different way to get energy. So they commissioned a power generating station, and found the right spot near the town of Pinawa. When, in 1904, the company became the WERCo, Winnipeg Electric Railway Company, the construction of the power plant was already underway. Many people told that it could not be done, transporting electricity over more than a 100 km, it would lose its energy in the same way as pressure in a water hose that is too long. 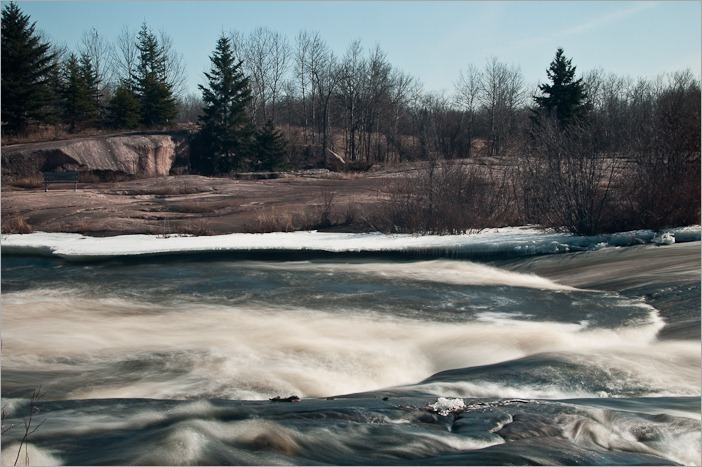 Today we know better, and partly thanks to the Pinawa Dam. 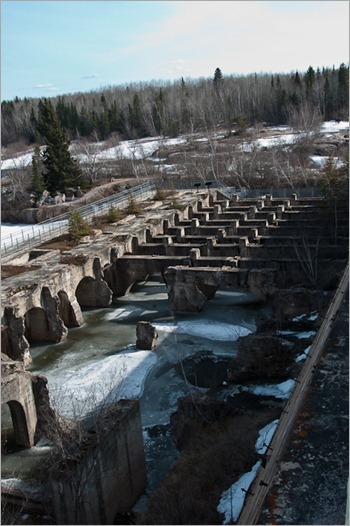 On the 9th of June 1906 the Winnipeg Electric Railway Company transmitted electric power from the Pinawa Generating Station on the Winnipeg River to the city of Winnipeg at 60,000 Volts, It was the first year-round hydro-electric plant in Manitoba and one of the first to be developed in such a cold climate anywhere in the world. 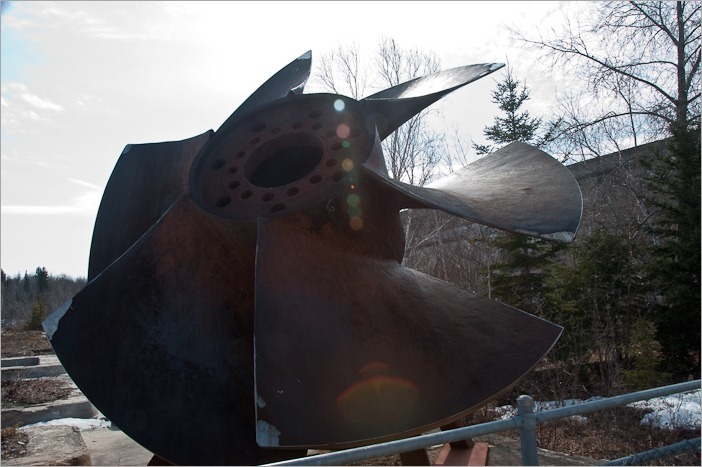 The power was generated using turbines, placed in the moving water. Different types were used, Propeller types and Francis types. Here you can clearly see the placements of the vertical turbines, just imagine that water is higher than the round holes that we can see today. The dam should create 14,000 kW of electricity, but thanks to the great construction quality it became evident that the plant was capable of 22,000 kW. Nice advantage! This view is from the “receiving” side of the dam, water is on the other side, pushing its way through. Here is where the generators stood. Can you imagine the water rushing through this hall? No, probably not, since all the water was going through enormous pipes and never saw the light of day in here. That is when the streetcars stopped and the Winnipeg streetlights went out. The homes were still lit, since most people still used oil lamps for lighting. 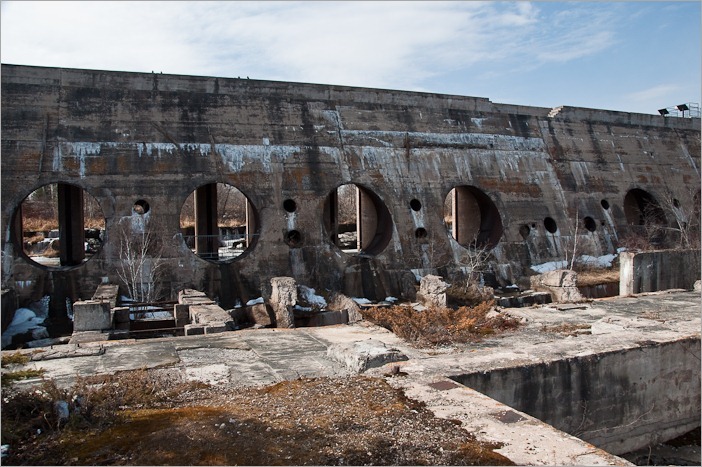 On November 23, 1909, a penstock burst and flooded the generator building. Repairs took two weeks during which the buses and streetcars did not move in Winnipeg. No one was hurt in the accident. When there is too much water, it should not go through the generators but simply flood away without doing any harm. 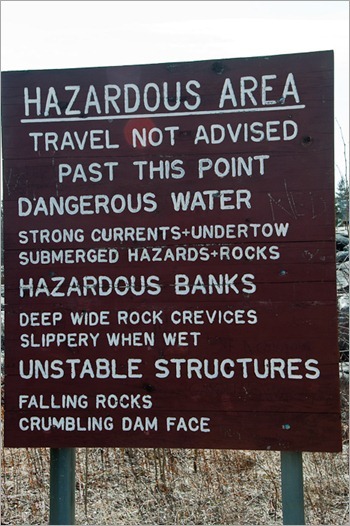 The spillway is doing just that. At the top there were ways to add still some logs so that the dam could withhold more water and increase the pressure. To decrease that pressure, the workers simply removed the logs. 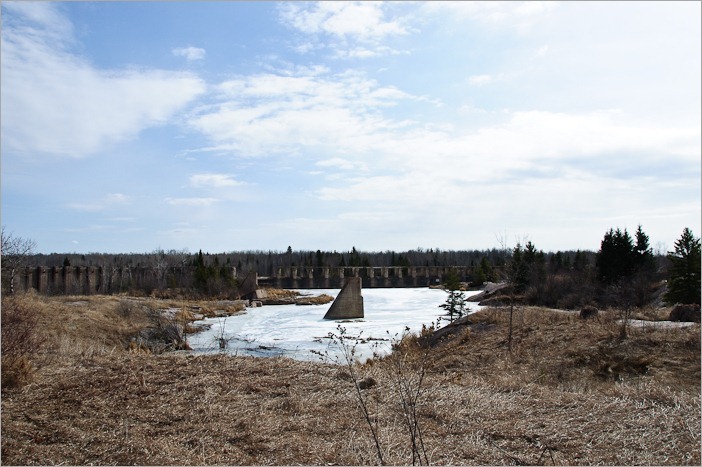 The water feeding the dam came from the Winnipeg river through a canal. This canal was blasted in the rocks. Why a canal and not simply take the Winnipeg River? Well, a canal can be controlled, a river cannot. At least not in 1906. 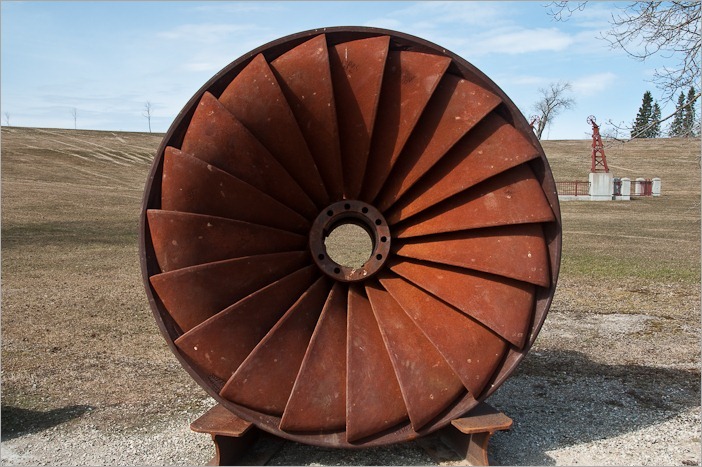 The Pinawa Dam generated power from 1906 to 1951 and made economical growth possible for the city of Winnipeg. 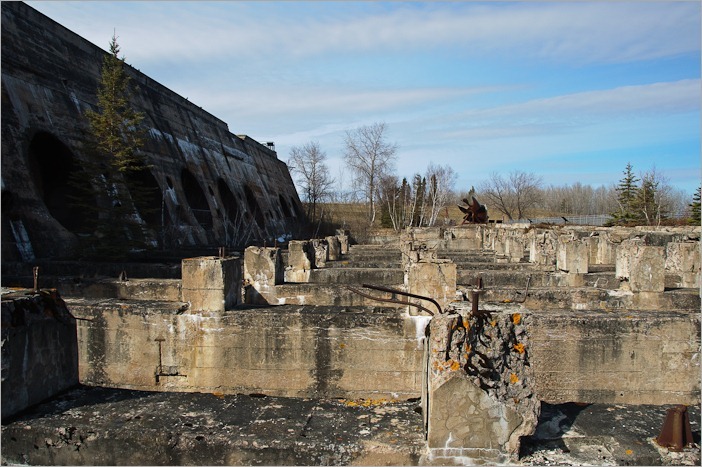 When it was decommissioned, the water it took from the Winnipeg river was returned to the river. This was done to increase the pressure on the new Seven Sisters Falls dam, a few kilometres away. 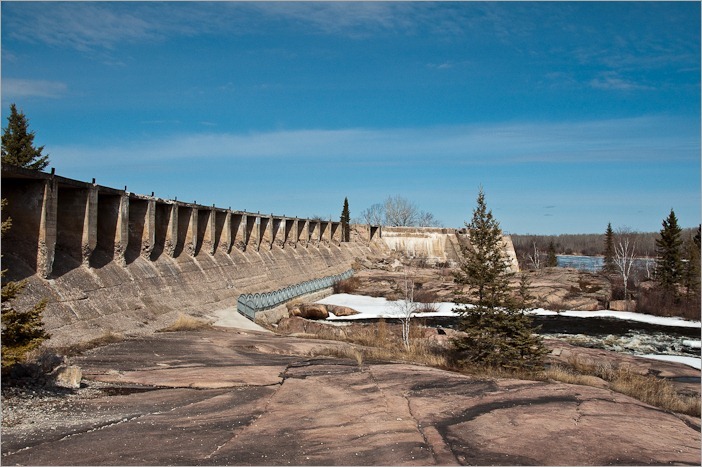 The current state of the dam, broken and in ruins is mostly the result of the Canadian Army, who used it for practice in blasting and demolition during the late 1950’s. Today it is a pleasant site, filled with places to sit, and fire pits. Grilled meat and pleasant days in view! It is definitely a place to go to in summer. In winter, car access is closed, you’ll have to carry your stuff over a distance of about 600m to get to the picnic place. But nobody will throw you out while the steaks are hot, don’t worry. A walk around the dam takes about an hour for the 700 metres long trail.